Jordan Brand is looking to impress once again with the use of a “cool grey” color scheme on one of their best-selling lifestyle collection shoe. This November, Jordan Brand will be releasing the Cool Grey/Sonic Yellow – Black – White colourway of the Jordan After Game, which was the shoe worn by the great Michael Jordan every after game during his playing years. The silhouette features a dominant cool grey upper part with black midsole and white outsole and lace. 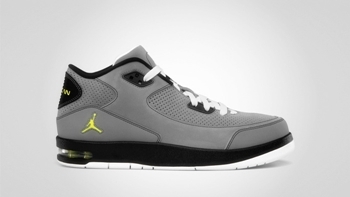 The shoe was also enhanced with touch of sonic yellow on the Jordan and Jumpman logo. This one looks very impressive so watch out for it! Another Jordan After Game Available This Month! Two New Jordan Courtside Shoes Lined-Up This Month!